Jean-Philippe Gouigoux is a French software architect & MVP Connected Systems Developer. He regularly talks at University of South Brittany and Agile Tour. Win a Surface RT tablet from a performance hint on ASP.NET ou SQLServer ! 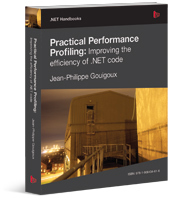 My book about .NET performance profiling just got released!